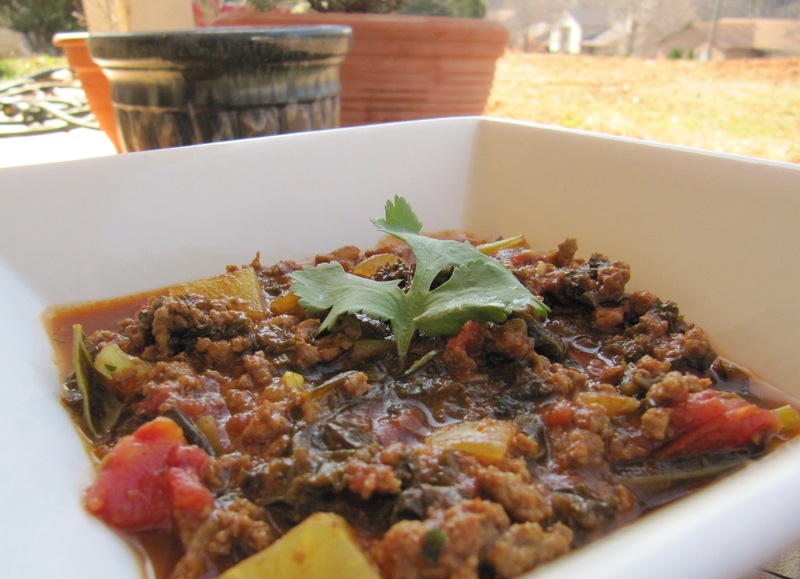 This hearty chili-like dish is exploding with aromatic Indian spices and packed with nutrition. It freezes beautifully, so this recipe is for a large batch and could easily be halved if desired. Adjust the amount of cayenne added to control the spiciness of the dish, the recipe has a bit of a kick as written. If you do dairy, this would be nice topped with a dollop of good yogurt. Brown lamb or beef over medium heat in a large pot. Remove lamb from pot and set aside. Add onions to pot and cook, stirring occasionally, for a few minutes until they begin to soften. Add kohlrabi and garlic and continue to cook until kohlrabi is just fork tender, about 10 minutes. Add kale and saute until wilted. Add in all spices and stir for 30 seconds. Add tomato paste and stir well. Add tomatoes, meat and stock, bring to a boil, then reduce heat and simmer for about 20 minutes, or until kale and kolrabi have reached desired tenderness. Stir in cilantro, add additional spices and salt to taste. Enjoy! This entry was posted on Thursday, February 17th, 2011 at 4:04 pm	and tagged with beef, chili, indian, kale, kohlrabi, lamb, masala, paleo, primal and posted in Food. You can follow any responses to this entry through the RSS 2.0 feed. WOW. I have a pound of ground bison thawed and a new Garam Masala box………… I may just have to do this! I harvested kohlrabi and kale from my garden and had lamb stew meat before searching for a recipe. This one was a big winner! When do you add the meat back in? At the end? Or maybe with the tomatoes and stock? Sorry about that! I add it in with the tomatoes and stock. Awesome! I look forward to trying it!